This is a typical dial from the Tucher workshop, although probably of everyday use. 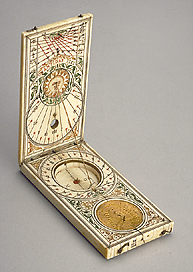 It has string and pin gnomon dials, and volvelles for converting time between the different systems of hours. On the bottom side is a table of epacts, which as in many Tucher instruments, has the terms 'Julian' and 'Gregorian' reversed and starts with 17 / 7 instead of 28 / 8. It is finely decorated with coloured ink: red, green, brown and black.